This is awesome. I really don’t have much else to say, other than I only made this because I had butternut squash laying around and eggs and stale sourdough bread. 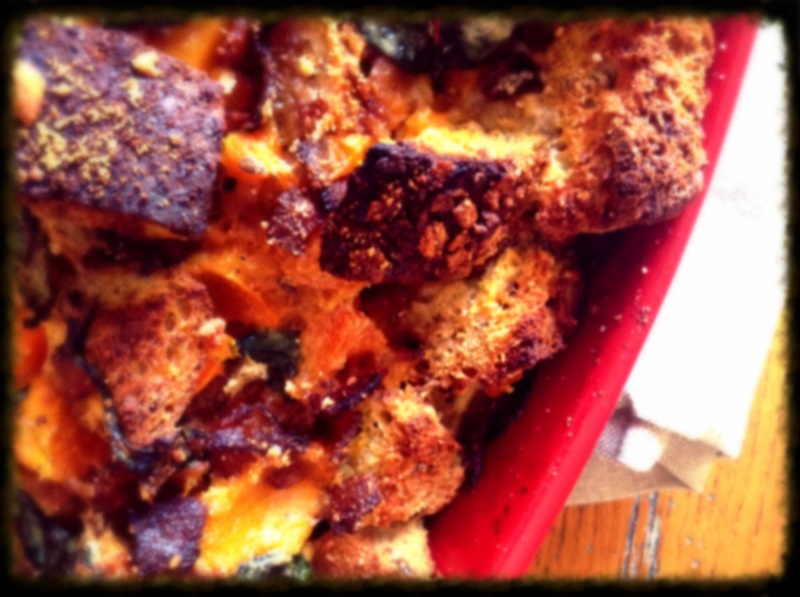 I had seen a recipe for a butternut squash sage strata before but it had way, way too many steps…like make an onion béchamel, cool and fold into the egg mixture. Wtf. Béchamel is for lasagna (which I will get to one of these days). Too much work. So I did what I usually do, I made the recipe up. I looked at a few other strata recipes and borrowed and combined and added my favorite things (bacon and parmesan) and came up with this beauty. 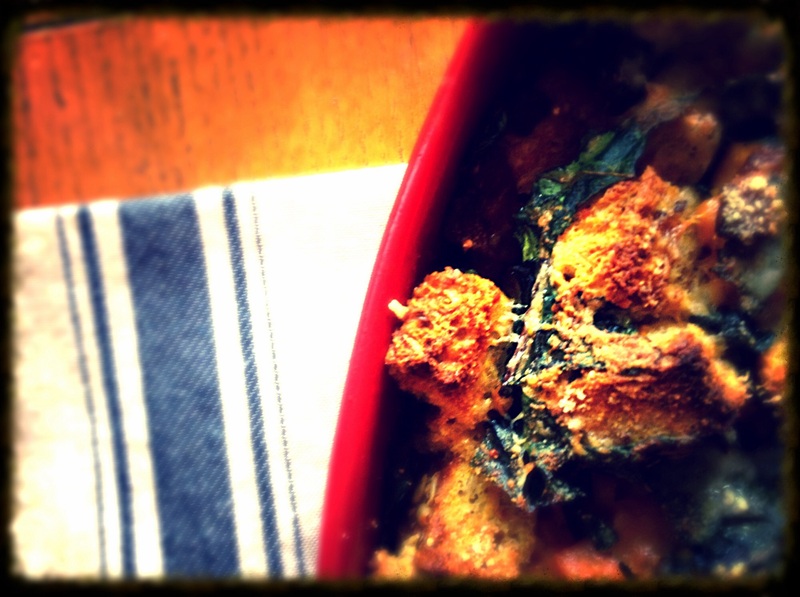 Ideal for a lazy weekend morning, or a holiday brunch party or even for dinner. We ate it for dinner…and I mean we ate it…the entire dish was gone. 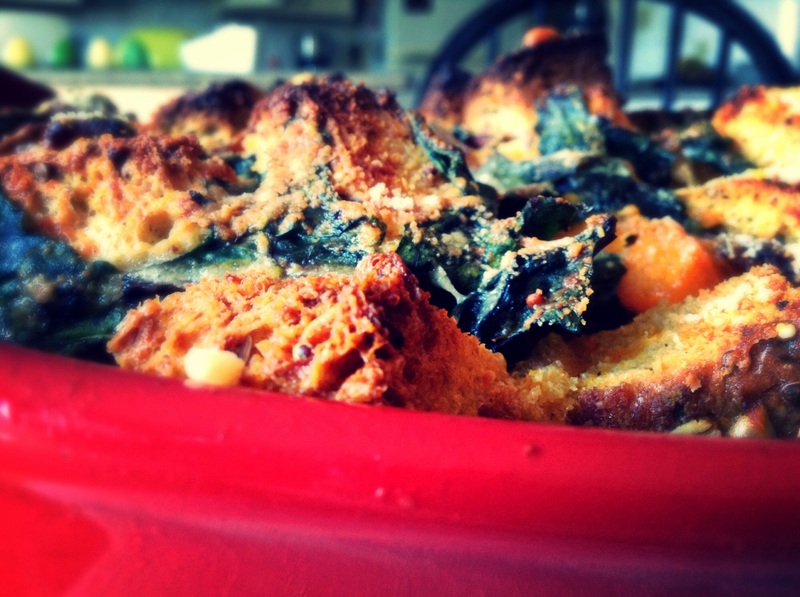 Butternut squash and Swiss chard strata – adapted from several recipes, main idea from Food and Wine. Heat oven to 325 degrees. Line a baking sheet with foil and spray with cooking spray. Empty bags of squash onto tray and drizzle with a decent amount of olive oil, a hefty pich of salt and black pepper. Toss together and spread evenly on the cookie sheet. Bake until squash is tender and can easily be pierced with a fork. Cool off to room temperature. Cook bacon in pan until crispy and fat has rendered. Drain off some of the fat and sauté shallots in bacon fat until caramelized, if needed, add a little olive oil to the pan. Add Swiss chard when onions are almost finished caramelizing and cook until slightly wilted, and sprinkle with a little pinch of salt and pepper. Cool off to room temperature. Butter a 13×9 baking dish (or spray it with cooking spray) and heat oven to 400 degrees. In a large bowl, whisk together the eggs, milk, cream, mustard, nutmeg, half cup of the cheese and pepper until smooth in your largest bowl. Add the bread, vegetables and bacon and combine well. Pour mixture into baking dish and push it down well in to the pan. Now, I did all of this in the morning at like 10am, and let it sit all day before cooking, because you really want the liquid to absorb well into the bread. Most recipes say to sit overnight, so let’s just say a minimum of two hours of sitting, but overnight is good too. Bake for about an hour at 325 and then turn up the oven to 450, sprinkle the remaining parmesan cheese over the top and bake about 10-15 minutes more. Let it stand and cool at least 15 minutes before eating.